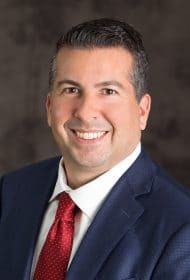 SEC issued proposed rules on the CEO pay ratio rule are still no closer to finding out what’s going to be in the final rules, when they will be issued, or when they will be effective. It’s been more than a year since the SEC issued proposed rules on the CEO pay ratio rule, and we are still no closer to finding out what’s going to be in the final rules, when they will be issued, or when they will be effective. One thing we do know: this ratio is going to be problematic. In this week’s issue of Agenda, the lead article “Directors Give Pay Ratio Rule Thumbs-Down” includes a reader survey on the potential impact of the rule. The majority of respondents reported that the rule will likely have a negative impact, either because it will fuel the fire for governance pundits and corporate agitators or because this exercise will be a duplicative and wasteful effort. 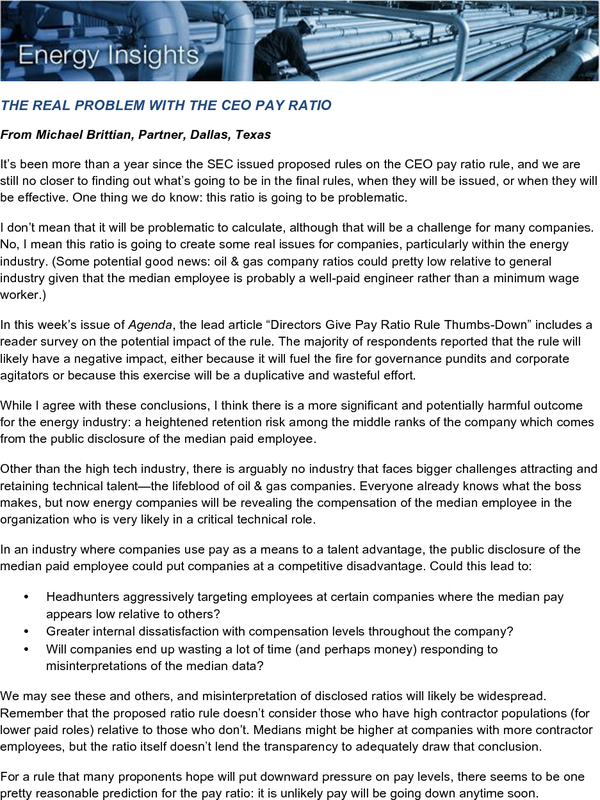 While I agree with these conclusions, I think there is a more significant and potentially harmful outcome for the energy industry: a heightened retention risk among the middle ranks of the company which comes from the public disclosure of the median paid employee. Other than the high tech industry, there is arguably no industry that faces bigger challenges attracting and retaining technical talent—the lifeblood of oil & gas companies. Everyone already knows what the boss makes, but now energy companies will be revealing the compensation of the median employee in the organization who is very likely in a critical technical role. Headhunters aggressively targeting employees at certain companies where the median pay appears low relative to others? Greater internal dissatisfaction with compensation levels throughout the company? Will companies end up wasting a lot of time (and perhaps money) responding to misinterpretations of the median data? We may see these and others, and misinterpretation of disclosed ratios will likely be widespread. Remember that the proposed ratio rule doesn’t consider those who have high contractor populations (for lower paid roles) relative to those who don’t. Medians might be higher at companies with more contractor employees, but the ratio itself doesn’t lend the transparency to adequately draw that conclusion. For a rule that many proponents hope will put downward pressure on pay levels, there seems to be one pretty reasonable prediction for the pay ratio: it is unlikely pay will be going down anytime soon.